The navy linen skirt features two side pockets. 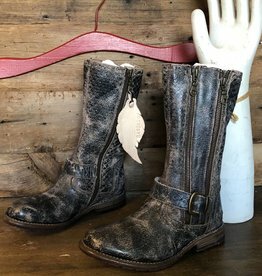 It can be cinched up on either side for a fun look, or worn down for the skirt to fall below the knees. The linen pants features two side pockets and an elastic waist. Layer these with m italia's taupe short sleeve linen top, as shown in the picture, and add the m italia linen cardigan for a complete look. The olive shortsleeve knit top has a flattering crew neck and is a comfy boxy fit that comes to a point below the hips. Layer this piece as shown with m italia's linen pants . . . or the skirt or gaucho linen pants. The linen gaucho pants has two side pockets and an elastic waist. They fall to the calf. Layer this piece as shown with m italia's linen shortsleeve top. The linen cardigan has 3/4 length sleeves that can be buttoned for a slouchy look. The cardigan falls below the knees. Layer it with any of the m italia spring pieces we carry, especially as shown with m italia's linen pants. 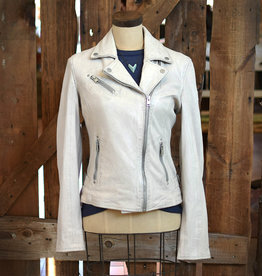 The else leather jacket is available in a dark shade of navy blue with a deep sheen. 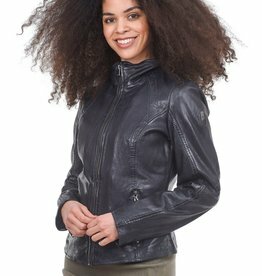 The jacket has a close fit, with princess seaming and zip pockets on the seams, lined in a lightweight woven cotton. 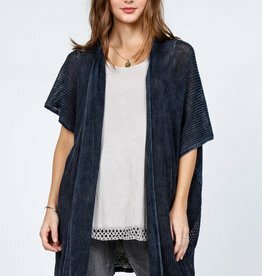 This beloved wrap cardigan, the wanderer open front poncho, is made in a light-as-air crochet fabric, while the back is made in M. Rena's cotton-modal mineral wash fabrication. Perfect to throw on over dresses and printed tanks. Whether you finish your look with a pair of leggings or with your favorite jeans, M. Rena's kenzie striped knit tunic will have you feeling and looking comfortable and casual. M. Rena's mineral wash sharkbite scoop neck top is a flattering and comfortable 3/4 sleeve top with a cute sharkbite hem. 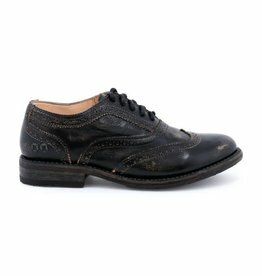 Made in a high quality tencel linen. Available in dark woodlands, a pretty mottled green. 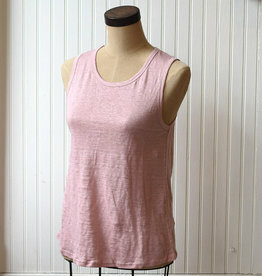 The sleeveless, twist-front tank top is a "twist" on your standard tank top. The muscle tank with crew neck has flattering twist in the front bottom, with a slight lo-hi to the back. The lovely soft micro modal fabric is breathable and packable. 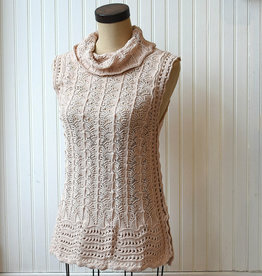 The rose distressed sweater is in a pretty rose pink. 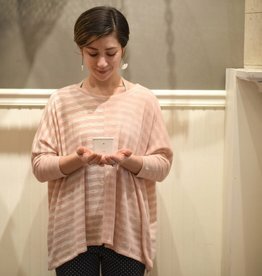 It's a loose fit, wide sleeve, rounded neckline, and funky distressed look makes this a fun and flattering spring sweater for all body types. 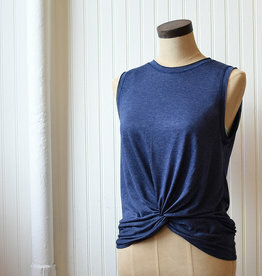 The slate 3/4 sleeve v-neck is in a pretty slate blue. It has a loose fit, wide cuffed sleeves, with a pretty v-neck. The cut is a bit of a hi-lo, with a swingy springy feel to it. L Love's striped wide pants are just perfect with this season's colors and cuts. They feature an elastic waistband with a drawstring, side pockets, and a wonderful wide leg, baggy fit for guaranteed comfort and pizzazz. The aurora tunic/dress with long sleeves will keep you warm until and through spring. Side pockets are perfect for that must-have tube of lipstick! The pink dolman striped top is a comfy loose fit with 3/4 sleeves. Sized S/M and M/Ll, this top is great for both full figured and smaller women. The rayon/poly knit feels like a high-end knit . . . soft and cozy to the touch. The waffle color block multi-color pullover has a fresh look for a fresh season. Taupe, navy, coral, and mustard blocks of color make this sweater a win-win with anything in your closet.